When hirsute rambling man Cole Jackson (Haggerty) returns to his rural Southern hometown of Macon County, Texas (which you’d think would be in Georgia), he rustles up a whole heap o’ trouble and becomes good ol’ boy enemy number one when he stumbles upon some illegal dealings. Smuggled goods, government cover-ups, threats, kidnapping and perhaps even...murder are all part of the corruption currently enveloping Macon County, a known hotbed for such things. Even though he’s staying with his younger brother Nathan (Jennings) and his wife Jenny (Bryant), Cole gets shot and spends the vast majority of the running time in a hospital bed. Will the Jackson family (not including Tito) clean up their town before it’s too late? Or will they just swig moonshine out of a glass jug until blindness sets in? Dare you find out today? 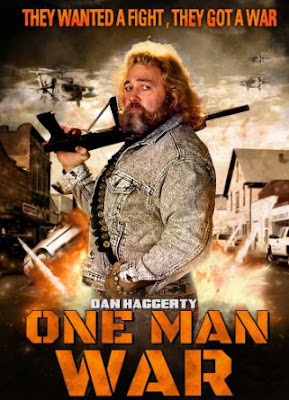 Despite the title and the promising prospect of Dan Haggerty shooting lots of people, One Man War (or Macon County War if you prefer, not to be confused with the Macon County series - Macon County Line, Macon County Jail, and Return to Macon County, from 1974, 1975, and 1997 respectively) is a disappointment. Haggerty is indeed likable, but he’s not in the movie enough. Watching his hair was the mane part of the movie for us (sorry). We kept asking, “why is this a movie?” - as a window into a living room, perhaps it works on its own terms, but why is there an abrupt jump cut to Nathan feeding the ducks? He picks up his gun and then shoots nothing and comes back a few minutes later and puts it back where he found it. If you’re aiming for action fans to view your movie, that’s not a good way to win their hearts. Like Lethal Force (2002), we were sucked in by the cool title and then left with scraps of nothingness. The whole outing is dull and repetitive. It makes Radical Jack (2000) look like a masterpiece. There are some amusing (?) older gentlemen in the cast, which perhaps was a precursor to later McCormick movie The Protector (1999), where Ed Marinaro and Lee Majors took center stage. Hard to believe this is only the second directorial effort from McCormick, coming just a few years after the underground cult horror gem The Abomination (1986). Two more different projects you cannot imagine, but perhaps he was showing off his range. While we know something underhanded is going on in Macon County, it’s never clearly explained just what it is, except maybe right at the end when we’re not interested anymore. There is a secret warehouse right out in the open, hiding away barrels of a translucent green liquid. We only could surmise from this that they are involved in the illegal importation of Hi-C Ecto Cooler. They’re clearly hiding it from Slimer as they brew their own homemade batch right next to their moonshine. Taking the concept of a “sit-down” role to a new extreme, Dan Haggerty comfortably LAYS down in bed for a lot of the movie’s running time. But wouldn’t you if you were in his shoes? Though to be fair, Haggerty’s hair isn’t the only point of visual interest - Jenny’s acid washed jeans provided a welcome oasis for our eyes amongst the nondescript morass of the rest of the movie. It should also be noted that there are some weak gun-shooting scenes, some limp car blow-ups and a laughably awful exploding helicopter. We’d say watch an episode of The Dukes of Hazzard instead of One Man War, but, due to political correctness, it’s been yanked (no pun intended) from TV. What’s this world coming to? And who ever would have thought One Man War would outlive and be more readily available than The Dukes? There isn’t a lot to recommend with One Man War. Go on YouTube and watch The Abomination instead. I agree. This movie was ultra low-budget. If a movie with this budget had been filmed in the Philippines, it would probably have featured Dan Haggerty as "Grizzly Adams Rambo" with Mike Monty as his CO, and the rest of the money would have been used for cannon-fodder extras and exploding huts. Unfortunately, now we get Haggerty in a lie-down role and duck-feeding. You killed it with this review. I actually had to stifle laughing out loud at work multiple times reading this. Kudos, good sir! I wish there was a way for some of the folks who worked on these movies you review in any capacity, be it acting, directing, make-up, special effects, etc., to be alerted when a review posts. I'm sure many of them were working paycheck to paycheck and forgot about these films a week or two after production ceased. I really think they'd get a kick 20 years later seeing well-crafted reviews (granted, it wasn't favorable, but you can only say so many nice things about a poor effort) about these films. Keep up the great work. These reviews are pure gold. Roger: Haha! You're absolutely right, if only the movie was like your description, this could've been a classic. Joe: Thanks so much for the kind words! We really appreciate it. Sometimes we do hear from the makers of these odd movies. Check out the comment section on The Last Witness. I found this one fairly enjoyable, I was quite sad when I heard that Dan Haggerty passed away. It was very sad when he passed away. Thankfully he has a huge filmography to remember him by.